A Terrorist organization called N.A.C. has a build a laser which is capable of destroying...no not the World, but the Ozone layer. You are the only one who can destroy it and so you must stand alone against hundreds of enemies. 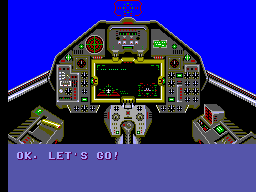 The Game is the Generic Side scrolling Shooter, pretty much the same like R-Type. 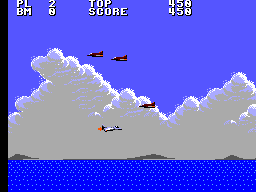 You fly from left to right and shot down all enemy Aircrafts, Ships and Submarines. Sometimes there is also a Rocket you should shot to receive either a new Weapon, Bombs (Single or Triple), a Speed-Up or Points. The Primary Weapon range from a normal Shot, 3- or 8- Way Shot to Lasers and Missiles. The Secondary Weapon are either a normal Bombs, Triple Bombs or Napalm. The Game consists of just 4 Levels and at the End of every round you must destroy a boss enemy. In the first Round a big Battleship, then a bomber, the Cliff Fortress and the big Laser called EL in the End This Game has 3 different difficulties. On Easy the little Fighters don't shot at you, while on Medium and Hard everything on the Screen is shooting on you, at in can be really to dodge everything. You can't finish the game properly with easy difficulty as this is more a 'training'. The Final Level is really difficult, as the Terrorist Base is small and Enemies come from all side. The Final Boss is hard as hell, as the Laser Weapon shots from 5-8 different Directions, has a Shield and you have nearly no chance. The Graphics are nothing special, everything is nice and tiny, except for the 4 Boss Enemies which are big and nice designed. The Levels range from Boring to good. The First Level shows you just the Sky, a bit of Water and some small Islands, nothing special here. The Second Level is the Highlight, you are above the clouds. You start with a nice sunset and the nearer you come to the End the Sky turns darker and then comes a nice Thunderstorm. The Title Theme and the Song from Level 2 are rather catchy; the other ones become boring quick. 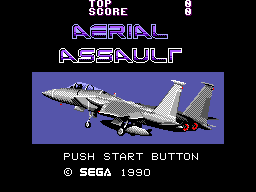 The Sound effects are the usual Master System Effects; most of the weapons have an unrealistic sound and sound more like Toys. The Controls are good. Button 1 is for primary Weapon and Button 2 for the Secondary. In the Beginning (and after every Death) the Fighter moves and reacts slow, but you can collect Speed-Ups to fast up everything. As the Game has only 4 Levels it is rather short. But as the Boss Enemies are hard to beat, it needs some tries to get to the Final. This Game has no Level select or Password, which means you start every time from the Beginning and the first Level is boring. But still the Game can be fun for a short Time.